This weekend's experiment was to see if I could make a baked yeast donut that was as tender and tasty as its deep-fried counterpart. The baked donut recipes I have seen all involve a donut pan and a batter (as opposed to a dough), but I wanted to go for the classic yeast donut. I do have a donut pan that I have yet to try out (sorry, Tina. I swear I will get around to it! ), but I suspect such pans are not a common kitchen commodity. The trick was to find the right method that would bake the donut without it developing a crust. The end result was pretty awesome, if I do say so myself. Not as tender as a deep-fried donut (and, of course, lacking that wonderfully crispy outside), but still very tender and delicious. Of course, the recipe is not fat-free (I'll leave that to more capable hands) but it certainly is fat reduced without the frying. The ingredients are the same as the original, but I simplified the method a bit. 1. Heat soy milk, water, shortening, salt, and sugar in the microwave, or on the stove, stirring regularly until shortening melts. Whisk in flax, then whisk in yeast. Let sit a few minutes, then whisk again until smooth. 3. Put flour in a large bowl and add soy milk mixture. Mix together into a rough dough, then knead for about 5 mins until smooth, adding more flour or more water as needed. The dough should be very soft and slightly tacky, but not sticky. Aim for a moister dough than usual for a more tender final product. 4. Transfer dough to a lightly oiled bowl, cover, and let rise for about 60 mins, until doubled in size. 5. Line 2 baking sheets with parchment paper. Lightly mist with oil. 6. Roll out the dough on a lightly oiled surface to about 3/8" thick. 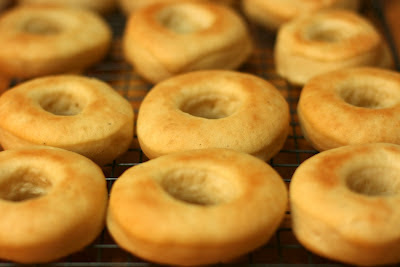 Cut out donuts with a donut cutter (see pic above). Dough scraps (and holes) can be re-rolled and cut. Place on prepared baking sheets (6 per sheet) and cover. Let rise for 1/2 hour, or until just about doubled in size. 7. Preheat oven to 500 degrees with rack in the middle. Bake donuts one sheet at a time. Place one sheet on top of another (i.e. you are baking the donuts on two sheets--this will insulate the donuts and keep the bottoms from getting too brown) in the oven and reduce the heat to 425 degrees. Bake for 5 mins, then gently turn donuts over. Bake for another 3 minutes. 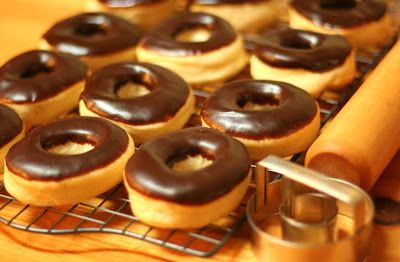 Donuts should be lightly golden (see below). Return heat to 500 degrees before baking the second sheet as above (but make sure the second sheet is new/cold). 8. Let cool, then glaze.